How many times have you read Dr. Seuss’ Green Eggs and Ham? Once? Twice? 20 times? 200 times? Many of us grew up with Dr. Seuss, and Green Eggs and Ham was a staple of our childhood reading. Published over 50 years ago, we’ve now grown up and are reading it to our own kids. How well do you know the book? Remember “Sam I am”? Something about a mouse, house, train, rain? How about the pictures? Do you remember what Sam I am looked like? The other character? 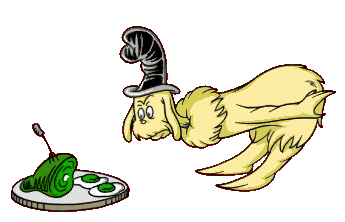 How about the star of the story, the Green Eggs and Ham? There’s a fork sticking out of the ham. Is there a knife? I have read the story probably hundreds of times between my own childhood and raising two kids (I read it twice last night). My eldest son asked the other day: Where is the knife? What are you doing every day that you know as well as Green Eggs and Ham? What are you not seeing? You evaluate what is there, the processes, problems, people, and paper. Do you evaluate what is missing? Take a look at your work. - Look for the knife. Wow... I can't believe I've never noticed that before! It's like the question, which way is the head facing on the penny? You've seen a penny a million times, but can you really say for certain which way the head is facing? I write a blog about dealing with trauma and PTSD. It's amazing how tuned in PTSD sufferers are to certain sights, smells and sounds, but do we ever take a moment to focus on the beautiful details around us? Not nearly often enough.